Both models feature a 28mm wide angle 4x zoom lens – allowing you to fit everyone in the frame or zoom in for close ups, while Canon’s Face Detection Technology ensures everyone looks their best, according to the press release. The IXUS 130 also offers fun, inventive ways to take the perfect picture – using a smile or a simple wink of an eye to release the shutter when you’re in position. A nice touch eh? I imagine there a few hitches with getting it to work in practice, but still, good. The IXUS 130 is the thinnest IXUS to date, measuring 17.8mm at its thickest point and is available in four eye-catching colours: silver, black, pink and orange. 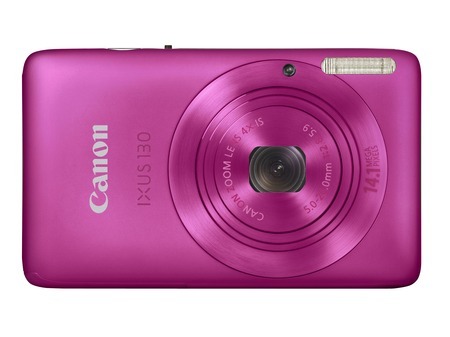 The more affordable IXUS 105 is available in pink, silver, brown and aqua. – Smart Auto with Scene Detection Technology which automatically selects settings for 18 different shooting scenes in the IXUS 105 and 22 in the IXUS 130. – Optical Image Stabilizer and Motion Detection Technology which counteracts the effect of camera shake and subject movement, allowing you to capture crystal clear images. – Both models offer Movie mode, with a YouTube upload function in the bundled software making it easy to share videos online. The IXUS 130 also delivers HD quality footage that can be watched with friends on an HDTV. Impressive, but wait on the ZunePhone people!